As Montreal braces for its annual mid-winter festival, a lot of which takes place au plein air as they might say, much of the US East Coast braces itself for the kind of frigid, snowy conditions that Montrealers witness 6 months of the year, illustrating just one of the ways they and their city distinguish themselves from the rest of us. In October 2008, we visited Montreal for the first time over Columbus weekend (US) aka Canadian Thanksgiving and came home fatter and much closer to our first stroke, but enchanted. Even though we hardly had time to scratch the surface on that brief sojourn, it didn’t stop us describing our chastening experience at the cruel hands of Martin Picard in excruciating detail nor blabbering on garrulously in a podcast about how fabulous it all was. Since then, we’ve barely touched foie gras, but we’ve been jonesing to return. The small matter of having two children making that rather more challenging. However, last summer we went back, returning as parents to a city we had greatly enjoyed as single folk excited, if a mite apprehensive, to see if our first family vacation would enhance or ruin our fond memories. On our first visit, we recorded a podcast of our reflections from our hotel room in Montreal. This time we also recorded a podcast, except that it took us more than five months to get around to this one and it only features one of us, as the other one was looking after our newborn, so our reflections are, ahem, a little more singular and reflective, and almost definitely more rose-tinted as we recall happy times eating delicious food in warm weather while contemplating what shoveling ten inches of snow in biting Arctic winds feels like. They say that returning to somewhere you have been happy is a mistake, but in this case, viewing it through the eyes of our adventurous three year-old, it was a real joy and revealed layers of the city that we wouldn’t have seen otherwise. These included more casual eateries, markets, parks and attractions (like the excellent Montreal children’s museum) and the rolling countryside surrounding the city, many of which we mention in the podcast, all of which are listed below. 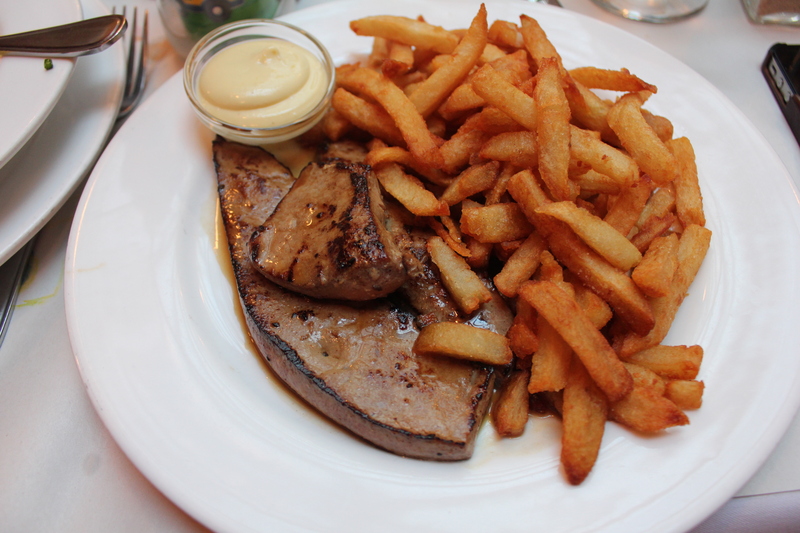 French specialties include: calves liver a l’estragon, soupe au poissons, steak/bavette frites, steak tartare. Portuguese specialties include: grilled Piri-Piri chicken, pork escalopes, french fries, rice, and natas, a Portuguese egg-custard tart flavored with vanilla. Guyanese specialties include: peanut punch, Guyanese chow mein, goat curry, pumpkin, and roti. Quebecois specialties include: poutines of all kinds. Read our review of this incredible institution here. Chilean specialties include: empanadas of all kinds – tuna, chicken, spicy beef and potato, etc. Montreal is a city I’m dying to visit (my favorite weekend brunch place in New Haven was covered in posters from its jazz festival, and they actually closed down every year to go to it), so I’m definitely filing this away for whenever we go there. Thanks again for posting this seemingly exhaustive list! I am with you and disagree with the notion of not revisiting a place that made you happy if you can make it happen, because places, like people, are complex beings. For years I had a complicated relationship with the city of Chicago–I always had to go for work reasons and something always went wrong on those trips–but I finally went for pleasure last fall to visit a friend, and I loved it. @Shayma: welcome back! we missed you! Congratulations on your son too! Isn’t it amazing how kids take up enormous amounts of time? At least before they can move around, you could stick them in the swing and get something done for a few minutes. Anyway, as you can see, we highly recommend Montreal for a family vacation. We wouldn’t normally consider going right into the heart of a major city as perfect for a young family but that’s another facet that makes MTL so different and enjoyable. We’ll be over to pay you a long overdue visit just as soon as we get a moment. All our best to you too!